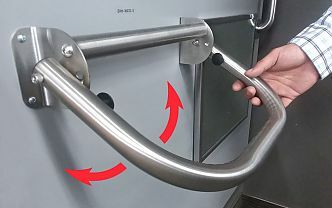 The unique design of an Extend A Hand folding grab bar means it is right there for you when you need it, and is out of the way when you don't. Easy release buttons allow you to fold the bar down and out of the way when not in use. A Grab-Bar You Can Actually Reach! Grab bar large surface area makes it easy to grip. Easy to use, lift and lock into position. After use, just press the buttons and the Extend A Hand easily folds out of the way. Extends out a full 12" for use of both hands for better stability & improved ergonomics. Can be mounted in the tub, shower, spa areas or almost anywhere that has an at-risk area for a fall - the Extend A Hand can lessen that risk. Easy to install, direct to wall studs 16, 24, or 32"
Warranty: 3 year mechanical warranty with 30 day satisfaction guarantee. Includes all necessary mounting hardware. Please call or use our Online form to receive an RGA (Return Goods Authorization) number within 30 days of purchase prior to returning merchandise, returns WILL NOT be accepted without one. Twenty percent (20%) restocking fee applies to all returns. Defective products will be replaced.